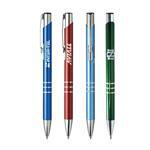 The Quasar Promotional Pen with soft grip. One of our most popular looks available in Blue; Green; Orange; Pink; Purple; Red; Smoke. 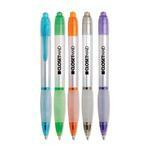 We love the feel of the grip as well as the thickness of this pen. Also available with our custom journals as well! FREE 1-DAY RUSH PRODUCTION AVAILABLE! ON SPECIAL! 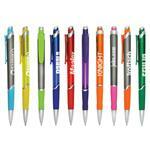 Available Colors: Frosted Colors - Blue, Smoke, Green, Purple, Red, Orange and Pink. 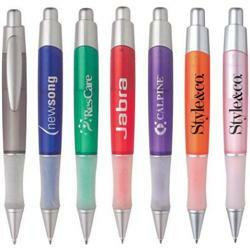 Available Imprint Options: 1-Color Screen. 15 pounds per 400 Approx.